If you are floating down the river and discover you forgot your favorite refreshment, no need to be concerned. J & J Bar and Grill in Nimrod has on and off sale, pop, cigarettes and a few supplies besides a full grill menu. Licenses can be obtained in the near by town of Menahga at the hardware store and at the Shell Station and Orton's BP. Limited supplies may also be obtained at Wahoo Valley by Cottingham Park. Huntersville Outpost Bar and Grill, located next door to Huntersville Canoe Outfitters, has a limited amount of supplies, including ice and beverages AND serves up a great 1/2 lb burger as well as other meals. Phone calls can be made from these points as well. The 31 miles of overland Crow Wing Wilderness Trail wind through the scenic coniferous and hardwood forest, along the beautiful Crow Wing and Shell Rivers. There are many more miles of interesting logging trails for additional riding pleasure. Fords and bridges cross the water at various points, adding to the scenic beauty and intrigue of the area. Campsites with corrals, drinking water and toilet facilities are provided for overnight camping. We have ample parking space for your cars. Parking on our property is free to our customers. 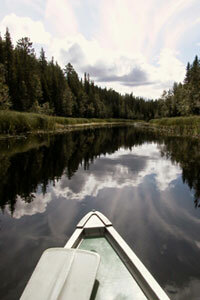 Experience is not an important factor in taking a canoe trip. Each year we outfit many people who have never taken a canoe trip or camped out before. Each newcomer receives our personal attention on canoe handling, packing of gear, setting up camp, cooking, general camping hints and map reading. We recommend that you bring a wide brimmed hat, and sunglasses. Even though you may have a good tan, all day exposure to sun on water can cause a painful sunburn, so a long-sleeved shirt and jeans are also helpful. You may need a warm jacket and heavy socks for early spring and later fall canoeing and a light jacket or sweater for the summer months. If we can be of additional help with your clothing and supply selections, please contact us. PROMPT delivery and pick service is arranged with your convenience in mind. When we outfit you with canoes, we will help move your cars and/or drivers. If you have your own equipment, we offer a shuttle service consisting of transporting equipment or locating your cars for a reasonable fee. 12 public campsites are located at convenient intervals along the river. All are scenic and wooded with plenty of room for hiking, bird watching and exploring. Each has fresh water, toilet facilities, picnic tables and fireplaces. Groups who desire trips on other than the Crow Wing Canoe Trail can make special arrangements with us and write for prices and particulars.